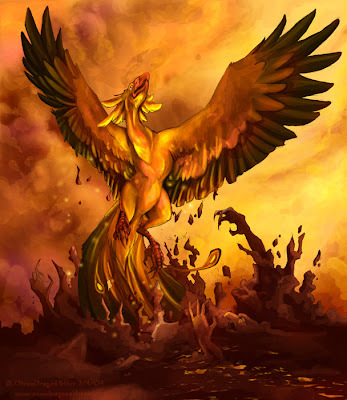 They have also another sacred bird, which, except in a picture, I have never seen; it is called the phoenix. It is very uncommon, even among themselves; for according to the Heliopolitans, it comes there but once in the course of five hundred years, and then only at the decease of the parent bird. If it bear any resemblance to its picture, the wings are partly of a gold and partly of a crimson color, and its form and size are perfectly like the eagle. They relate one thing about it that surpasses all credibility: they say that it comes from Arabia to the temple of the sun, bearing the dead body of its parent, enclosed in myrrh, which it buries. It makes a ball of myrrh, shaped like an egg, as large as it is able to carry, which it proves by experiment. This done it excavates the mass, into which it introduces the body of the dead bird; it again closes the aperture with myrrh, and the whole becomes the same weight as when composed entirely of myrrh; it then proceeds to Egypt to the temple of the sun. These and other classical myths concerning the bird appear to be misreadings of the Egyptian concept. In Egypt the bird did not achieve immortality through periodic renewal, but it was seen as a symbol for the sun, which did rise-like the bird-each day from the waters to the east. Perhaps the clearest Egyptian use of the bird was in the Book of the Dead where, as a sign of rebirth, it was beautifully depicted in the vignettes.